Mortgage insurance is certainly something every homeowner should have. But another safeguard you should look into is Flood insurance. Federal law requires all lenders to investigate whether or not each home they finance is in a special flood hazard area as defined by the Federal Emergency Management Agency (FEMA). Floods happen anytime, anywhere. But the Flood Disaster Protection Act of 1973 and the National Flood Insurance Reform Act of 1994 help to ensure that you will be protected from financial losses caused by flooding. Home Loans For All uses a third party company who specializes in the reviewing of flood maps prepared by FEMA to determine if your home is located in a flood area. 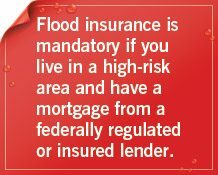 If it is, then flood mortgage insurance coverage will be required, since standard homeowner’s mortgage insurance does not protect you against damages from flooding. Mortgage insurance is something every homeowner needs. It’s there to ultimately protect you and your family.